When Junius Courtney arrived in the Bay Area in the mid 40s, he brought a personal musical legacy with him from a life of music in New Orleans. Courtney had direct exposure to Armstrong, Ellington, Sy Oliver and a host of other jazz greats who performed in New Orleans. He played in the trumpet section of Professor Valmore Victor’s Jazz Band from his teens and thrived under the tutelage of Victor - a resident sage. 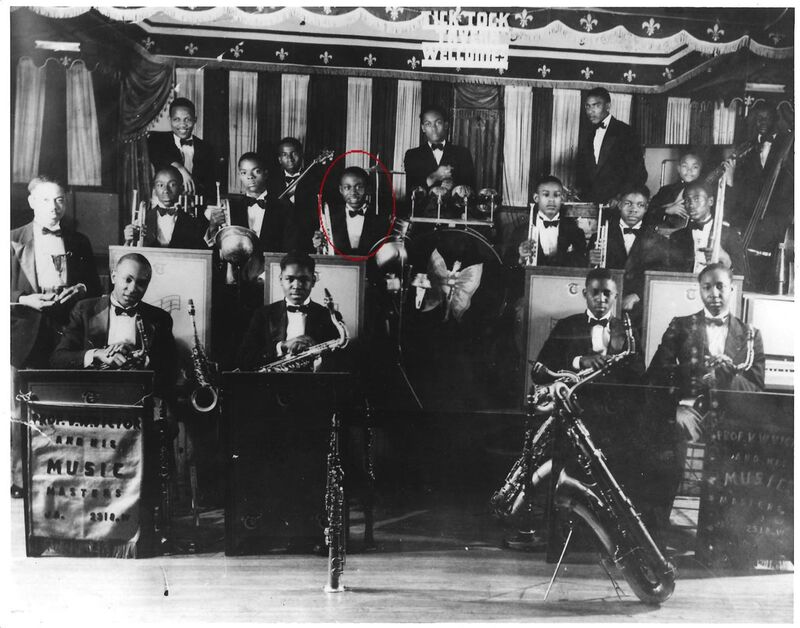 Junius Courtney pictured with Professor Valmore Victor's Music Masters at the Tick Tock Tavern, New Orleans, about 1935. Professor Victor, one of New Orleans outstanding music teachers, stands at the far left with the band's trophy from winning a local competition. Relocating to Berkeley, Junius Courtney developed his gracious performance style on trumpet and vocals, and gathered like-minded musicians to form jazz combos that played for numerous society and country club functions. Junius Courtney broke the color line in the East Bay music scene. He frequently led three or four combos per weekend night, as his driver transported him to front each of his small groups at different venues. In 1966, he instituted his big band, reaching for the fuller sound and heightened musical message. His big band had a long run at the Shattuck Hotel in downtown Berkeley, and appeared for special events and dances while the leader held down his day job and swung at night. Nat Courtney took control of the drum seat at Junius’ invitation, laying the foundation of the family feeling that the band continues.